British historian Phillip Guedalla famously described biography as “a very definite region bounded on the north by history, on the south by fiction, on the east by obituary, and on the west by tedium.” Were I to locate Gandhi: A Manga Biography on Guedalla’s map, its longest borders would be to the south and west: it’s both contrived and dull, a series of historical tableaux that do little to reveal Gandhi’s true humanity. Most of the book’s problems stem from its scope, as author Kazuki Ebine attempts to cover Gandhi’s entire life in a mere 192 pages. Ebine treats us to brief glimpses of Gandhi’s childhood, when Gandhi was first exposed to the injustices of India’s caste system; his time in England, where he studied law; his time in South Africa, where he challenged the government’s classification of Indians as second-class citizens; and his time in India, where he used strikes, boycotts, and other forms of non-violent resistance to protest English rule. Though Ebine carefully inserts major historical figures into the narrative, none of them are treated as individuals. Some are straw men, representing unenlightened points of view, while others are apostles, converted to the cause through the power of Gandhi’s words. Even Gandhi’s wife is relegated to a minor supporting role; her primary function within the narrative is to patiently reflect on her husband’s inherent courage and goodness, rather than interact with him as a partner, friend, confidante, or lover. (“Your duty is to lead people in a right direction,” she solemnly informs Gandhi.) 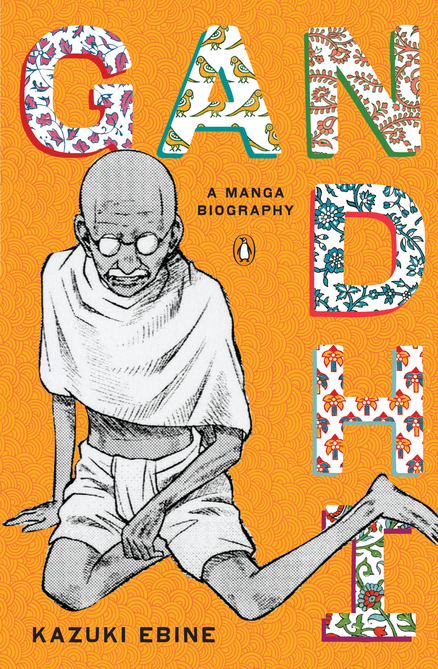 Ebine attempts to portray her as the one person who truly knew Gandhi, but the relentless pace of the story prevents him from showing the natural evolution of their relationship. The script is equally problematic, abounding in typos and grammatical errors. (“Pease enjoy this humble farewell party for you,” one character tells Gandhi.) The problems extend beyond mere editorial sloppiness: the dialogue would have benefited from a vigorous re-write, as it sounds more like a poorly translated Power Point presentation than natural conversation. In one crucial scene, for example, a young South African man confronts Gandhi with what amounts to an eighth grader’s gloss on the crisis in South Africa. “When I first heard your speech, I was so inspired as if you boiled in my blood!” he declares. “No one else has tried to rise up against the whites. As Indians, we have decided to fight together beyond the differences in religions.” Another character tells Gandhi, “By revoking Indians’ right to vote, they try to shut our mouth up regarding sovereignty” — an indignity up with which he will not put. The biggest disappointment, however, is that Ebine makes such uninspired use of the comics medium. The artwork is plain and lifeless, relying too heavily on computer shortcuts and pre-fab backgrounds to create a genuine sense of place or time. Though Ebine depicts numerous violent confrontations, most of the layouts are an unvaried parade of talking heads addressing assemblies and conducting back-room negotiations. To judge from the characters’ facial expressions, these scenes are meant to be as dramatic as the brawls and massacres, but the monotony of the presentation robs these scenes of specificity and urgency. The bottom line: readers who want an overview of Gandhi’s life and work may find this slim volume helpful, but readers hoping to move beyond what Mark Twain called the “clothes and the buttons of the man” will be sorely disappointed. I’ve noticed a trend in certain people to underestimate the comics medium. From what you say about this manga it almost sounds like somewhere, some business man said, “You know what the kids like? Comic books. Let’s make a comic about Ghandi’s life, they’ll eat that right up.” And of course the actual creative process is ignored. An extreme example of this is those terrible comics that are nothing but stills from the movie laid out in the page. It’s just so…dead. Also, I now feel like I want to read a comic about Ghandi that is actually good. Can any one else say “Shonen Fighter Manga Based on Ghandi”? You’ve put your finger on the problem with all of the manga bios published by Penguin: there’s no reason any of them need to be comics. The artwork didn’t play a big enough part of the story for it to be an indispensable element of any of them. In the Gandhi manga, it even became a distraction, as the artist used some pre-fab cityscapes that were flat-out wrong for the historical period being depicted. I’m still waiting to read a great bio-comic; I know it’s out there, but I just haven’t seen any biographers (or memoirists) use the medium to its fullest.